Graduate from Rouen School of Art and from the European institute of Ceramic Art of Guebwiller, Charlotte Coquen lives and work in Rouen since 2015. After taking part in collective exhibitions in France (Biennale, Chateauroux ; 116, Montreuil; Non Lieu, Roubaix … ), Keramis – Center for Ceramic (Belgium) dedicated in 2018 her first solo-exhibition. Her protean approach, centred principally on sculpture and installation, grants a privileged place to ceramic. The artist develops researches based on identity and different interrogations relative to the body, social links, hierarchy, filiation, mythologies, to history and its codes… She juggles gleefully with mediums and techniques in order to materialize her intentions and show sequences of tragi-comic lives. 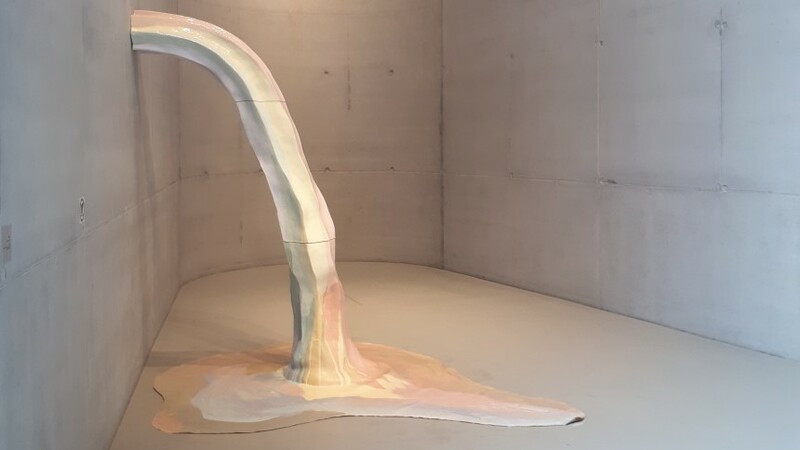 The project “Tagadaaaa…” is composed of a first painting entitiled “Tagada#3”, a giant glazed ceramic rainbow, welling out of a great coloured latex puddle. This project takes place in a recently renewed hall in the Ceramic museum of Rouen. This place nourishes the many paradoxes developed in this artwork. The hall reflects the social success of its occupant. It is a place devoted to the demonstration of prestige with the artwork usually strengthening the decorative scheme. With Tagada#3, the opposite happens: The hall is crowded with this impossible object telling us about happiness, as ephemeral as success. In parallel, “Tagada#2” is installed in a dining room, on a prepared table among tableware from the historic collection. It raises questions on the link between beautiful objects and the desire to own. Two room sets will also be exhibited inside the museum. “Chez Propsper Tagada” is made up of a set of engravings. This gives a representation of an imaginary space in which figure Prosper Tagada. The rainbow arises inside a space materialized by three lithographed lines. In parallel, out of the last production of the artist, fake ceramic neon: “Joyeux Bordel” (“Happy disorder), “D I E U S” (“G O D S”). They answer, sometimes discretely, to the ambience and to the patrimonies of the museum’s room.